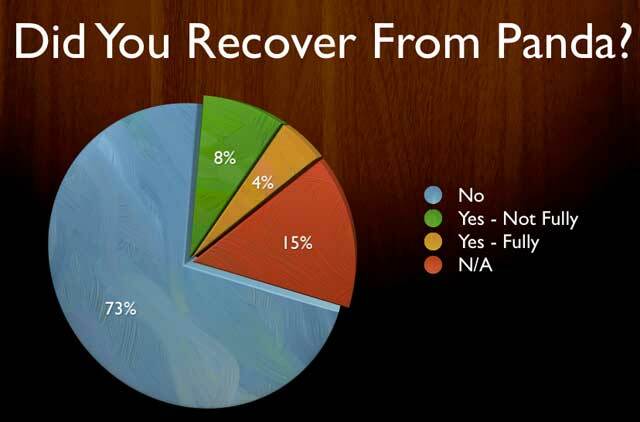 A couple weeks ago I ran a poll asking Did You Recover From Panda? With over 500 responses now in, I wanted to share the results. Like I said before, I really think no one has recovered fully from this Google update - not yet at least. Here is the full chart, also adding in those who responded that it was not applicable to them. I will be sharing the full results at a long presentation I am giving in Spain next week at ISDI, if you are in the area, please do come. For more on where I'll be speaking about Panda and other search related topics while I am in Spain, please see the RustyBrick blog. Previous story: Do You Report Malware In Search Results To Google?